I have been reading Felicia Day’s memoir “YOU’RE NEVER WEIRD ON THE INTERNET (almost)” and I came across this page. The mantra on that cup really hit home with me. “You can attempt anything.” It is such a simple sentence, yet it has such a profound meaning. She says to “Repeat that motivational cup sentence until it gets in your gut and doesn’t sound like something stupid on a Hallmark card, because it is the basis for anything that will make you happy in this world.” I paused reading and started doing that. At night I say it, in the morning I say it, and throughout the day I say it. Go ahead and say it now a few times, out loud. Go on, I’ll wait. Okay, after repeating it, it starts to get more meaning doesn’t it? So much in life is kept from us because we are afraid to try. We are afraid to make the attempt. We are afraid of failure. What if the attempt itself was the goal? You wouldn’t fail, as long as you made the attempt. It is like anything in life, take baby steps. Your ultimate goal may be to make a hit web series like Felicia’s was. Or, your ultimate goal may be to lose a bunch of weight, ask that cute guy out, become an actor, master a craft, or making the perfect baked alaska. All of those things can be overwhelming, scary, and intimidating. If your goal is to ATTEMPT it though? Not so scary. As long as you attempt it, then you have reached your goal. Once you have made the attempt, one step is out of the way. From there you can create further goals, and make those goals to attempt the next step. Next thing you know, you just might have accomplished your ultimate goal. With each step, you will slowly be conquering your fear of failure. Finally, you can be proud of the fact that you tried. Yes, failure may still happen, but you tried. You won’t have that guilt, or that regret from not trying. The unknown is the scariest thing in life, which is why so many people do not attempt so many things. We cannot know what will happen in the future. There are no guarantees in life. So, we tend to stick with what we know and accept that as our fate. I think that by using the mantra “You can attempt anything”, it will help alleviate some of that fear. The outcome and chance of failure is scary, the actual attempt is not. So in short, You can attempt anything. Keeping in line with my Perspective theme for today, I would like to use my work for example. I am a hairstylist and today we were extremely non-stop busy. A couple of co-workers were complain non-stop about it. They were talking about how tired they were, how they were hungry, how “these people” wouldn’t give them a break, their backs hurt etc etc. So, on top of feeling the tiredness, the hunger, the back pain, they added stress and judgmental thoughts toward customers. They also vocalized it and dwelled upon it which made it worse, and shared that negativity with other co-workers. Every time they wold complain, I would try to point out the positive about the situation. We were busy, so that means the shop was making money. The shop was making money so that means it is staying open and not closing anytime in the near future. The more customers we have, the more likely they are to come back, and increase business overall. Plus, in our industry, the busier we are, the more money we make. The more money we make..well its obvious all the good things that cause. So, while it was a tiny bit stressful, tiring, and perhaps a little painful, it is easy to see past all of that and to the good things that can come from it. 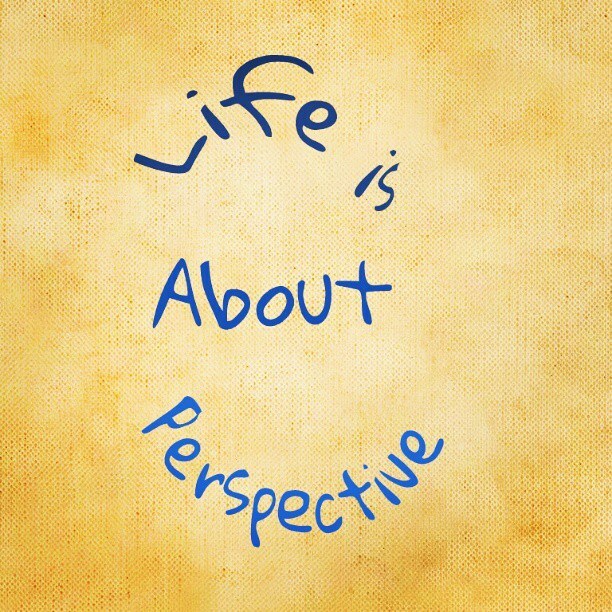 This is just an easy example of how perspective can make a world of difference. I know I got off work feeling great and happy about my day. I feel accomplished and I look forward to another day just like it. Would I feel this way if I took the other route? I really doubt it.